Susan & Marianna Miranda collecting the Continental Divide National Scenic Trail Stamp. Cuba is now home to an official Continental Divide National Scenic Trail stamp, one in a series of nationwide collectible cancellation stamps. On July 3rd, 2018 National Park Travelers Club (NPTC) members Susan and Marianna Miranda from Minnesota were the first to claim the stamp. National Park Travelers Club is a non-profit social club organization devoted to spreading appreciation of the United States National Park system. The Continental Divide National Scenic Trail (CDNST) extends 3100 miles from the Mexican border in the southern bootheel of New Mexico to the Canadian border in Montana’s Glacier National Park. The first 770 miles of the trail are in New Mexico. It passes through Cuba, one of the Continental Divide Trail Coalition’s Gateway Communities. The trail approaches Cuba from directly south of Cuba Mesa, passing through Cuba and eventually heading northeast into the San Pedro Wilderness up Los Pinos Road. Over 200 hikers attempting the journey annually stop in Cuba to rest & resupply. Cuba is proud to represent the CDNST and join over 400 National Parks in this cancellation stamp collecting program. You can collect the stamp by bringing your copy of the “Passport To Your National Parks” available online at www.eparks.com and at bookstores to Step Into Cuba at the Public Health Office, 6362 US 550 or contact us at www.stepintocuba.org/contact-us to setup a time to collect the stamp. To learn more about collecting park stamps visit www.nps.gov & www.parkstamps.org. To learn about the Step Into Cuba Passport visit www.stepintocuba.org/passport. On Friday November 25th, the day after Thanksgiving, a group of friends, neighbors and family participated in a "Gratitude Walk" to enjoy and be thankful of the beauty of the Cuba area and the work of the volunteers who build and maintain local hiking trails. The walk took place on the Fisher Community Trail, which was created by the Step Into Cuba Alliance on land adjacent to Cubita Road (1 mile north of the NM 197 junction) that was donated by the Fisher family. The trail, which is about a mile long, follows contours of the side of the tree-covered mesa uphill and downhill until it crosses a large arroyo. It then climbs to a ridge leading to a corner of the Santa Fe National Forest. During the walk, group members exchanged information about local history, geology, and wildlife. At the top of Cuba Mesa, they spotted both a red-tail hawk and a golden eagle while taking in the incredible view of sandstone cliffs, the Nacimiento Mountains, and the Village of Cuba. The participants expressed gratitude for the opportunity to walk in the wilderness so close to the center of Cuba. For more information about upcoming community hikes contact Alejandro Ortega at alortega@salud.unm.edu. 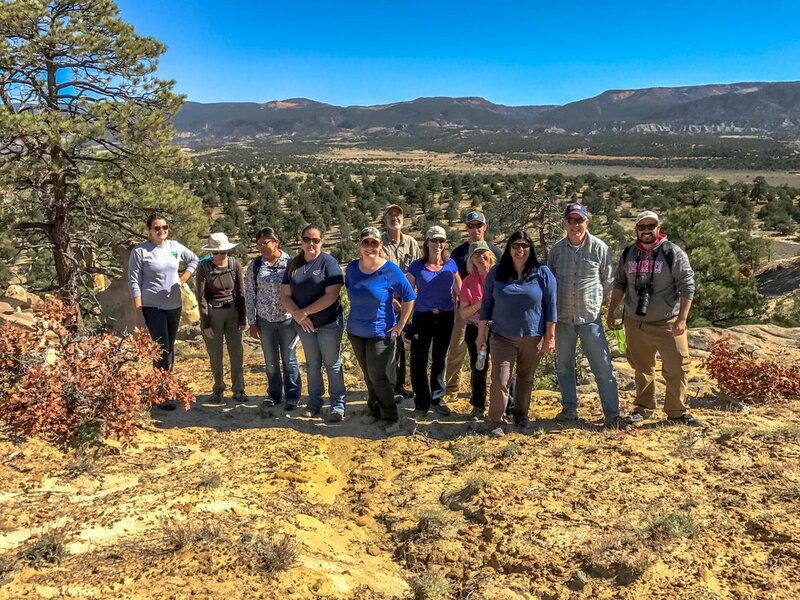 In celebration of National Public Lands Day a group from Cuba, NM hiked the Cuba Schools Cross Country Trails and the School Overlook Trail. Along the hike Cuba Middle School educator Mary Lou Gooris pointed out local flora and discussed how to pursue a career in science. Dr. Richard Kozoll discussed the geology of the area and the importance of public lands as the group crossed onto BLM land for the Overlook Trail. Wildland Firefighters Bryan Sandoval & Jessica White discussed fire prevention & safety and provided a fun hands on demonstration of some of the gear used to fight fires. Student Laurance Gallegos and Wildland Firefighter Matthew Brown performed as Woodsy and Smokey, entertaining and taking pictures with the group. Dr. Connie Constan, Archeologist USFS, Santa Fe NF, Cuba Ranger District, discussed local heritage with the students and discussed the higher education needed for a scientific career. We would like to thank all the volunteers and coordinators who made this event possible and all the community members who came to celebrate and learn about our Public Lands! Check out the recap video of the event below. The Village of Cuba and its Step Into Cuba partners have created an active transportation and outdoor plan consisting of interconnected present and future sidewalks, paths, and trails. On October 13 Cuba was honored by a visit from US Forest Service (USFS), US Bureau of Land Management and Continental Divide Trail Coalition (CDTC) leadership for the Continental Divide National Scenic Trail (CDNST). 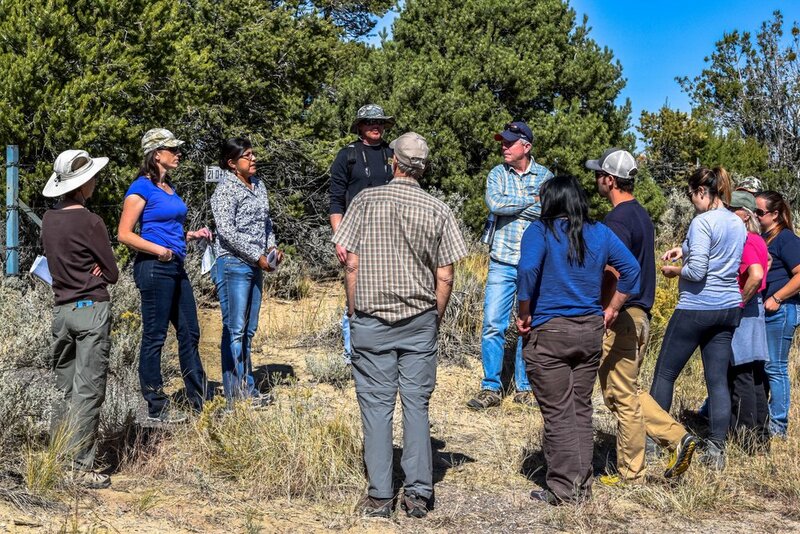 They were hosted by Ranger Jaime Bennett and Natural Resource Specialist Jeff Bell of the Cuba Ranger District, Santa Fe National Forest, and Richard Kozoll and Alejandro Ortega of the Step Into Cuba Alliance. Cuba was the second designated CDNST Gateway Community and a proposed new segment of CDNST will bring the trail to within two miles of the Village limits. The purpose of the visit was to familiarize USFS CDNST lead Brenda Yakoviac, and others new to the proposed re-route, with the Cuba area and new Trail segment challenges. Brenda was accompanied from Colorado by Teresa Martinez, Executive Director of the CDTC and already a friend of several persons in the Cuba area. The group met at the new Becker-Mace Nature Trailhead, where the new route crosses the Rio Puerco under the highway just south of the Piedra Lumbre Road. We then visited the Sandoval County Fairgrounds, expected to be of great support to persons hiking the new trail route. From the Fairgrounds we hiked a half-mile of the route from County Road 11 to a ridge overlook of the Arroyo Hondo and Cuba Valley. The group then looked at the proposed route’s NM 126 crossing before ending the tour. The route is undergoing an environmental assessment that should be completed in the near future. For people with questions about or interested in volunteering with the CDNST project, contact Richard Kozoll at 505-249-5733.